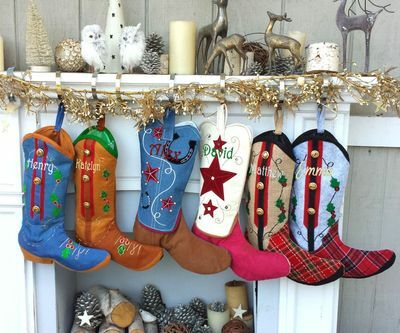 Super nice and well made cowboy / cowgirl Christmas stocking in a boot shape. These stockings are personalized in a smaller embroidery font as we have less space on the boot to embroider. The are just great and so well made! Yes, those are real jingle bells on the boot! Measurements: The jingle stocking is plenty big, about 17" diagonally and 6 1/2" wide. The Horseshoe and Star Stockings are about 1 inch longer and little wider. Materials: The stocking is made from felt, satin, metallic adornments, just beautiful. Lining: This stocking is lined inside with green polyester satin. We also have a matching cowboy boot in a different color so you can make a set for the whole family. We have a sample picture of the stocking monogrammed with metallic embroidery thread ... click on the thumbnail image in the top corner of this page to see a larger version.